Over in Moscow and St. Petersburg Russia, the Winnipeg Jets had a few players representing the organization. There are also a few players that potentially could be part of the team in the near future from the second overall selection in 2016 NHL Entry Draft. The tournament was a fun event for Jets’ fans to observe, especially with the team missing the post-season once again. Let’s take a look at some of the performance for the Jets (and notable players). The Winnipeg Jets’ representatives played fairly well over the tournament, with every individual putting up at least one point. The best part though was the Jets ability to generate shot volume, with even noted shooting-shy Alexander Burmistrov shooting over a shot per game. Nikolaj Ehlers was fourth in shots per game, while (potential Jet) Patrik Laine was ninth in shots per game and first in total shots. We can even dig into the data a bit further than the surface level statistics. The Hockey Ninja put together a team of trackers that tracked Corsi for multiple games (although there are still holes in the data set). For the most part the Jets played on exceptional teams, so above average Corsi percentage (shots for / all shots while on ice) is pretty much expected, but it’s great to see a great deal of the players leading their teams in a positive manner with relative Corsi percentage (Corsi on-ice minus on-bench). I also created my own offensive creation metric, looking at the sum between a player’s z-score in shots and points per game. Essentially this looks how well the player drove offense relative to their peers, where 0 is the tournament’s average for forwards. There have been no games tracked for the Denmark players, so we don’t have Corsi percentage or similar numbers for Ehlers. We do know that Ehlers drove shot differentials at an exceptional rate in the NHL last season, and would likely then have a positive relative Corsi percentage. However, the Danes controlled only 42 percent of shots for all mins, which was only better than France, Hungary, and Kazakhstanan. In terms of offense though Ehlers drove a ton. Ehlers was 8th in the tournament for Offensive Z-Score (Zsum in table), second on Denmark, and best of all the Jets’ currently owned players. Ehlers, with Niklas Jensen and Lars Eller, were the Danes primary source of scoring, and Ehlers also led the team in shots on goal. All chart courtesy of The Hockey Ninja. Right: better shot suppression. Up: better shot generation. Green: better relCorsi%. Mark Scheifele and Mark Stone were attached to the hip for the tournament at 5v5 and Team Canada really should have no complaints. The team generated both shot volume while suppressing the opposition by a good margin. Scheifele posted the team’s second best relative Corsi percentage, 12th best for forwards tracked, all while scoring at a point per game pace and placing only second to Taylor Hall in Offensive Z-Score, and 13th best for all forwards. Scheifele’s performance hopefully will earn him a spot on the Youngstars’ World Cup Team, and have Jets fans salivating for a potential 1-2 Scheifele and Little punch for 2016-2017. The Jets sent Ivan Telegin a qualifying offer after his NHL contract expired, meaning that Telegin is still Jets’ property for NHL purposes regardless of probability of Telegin coming back to North America. Considering Telegin’s age and lack of extensive development over the past few years (with time loss from a major concussion and a team suspension), the once highly touted prospect from the Atlanta Thrashers’ final draft made an impact in a world class tournament. Telegin’s two-way numbers were not overly impressive, but he did put up both points and shots. His future will be one to watch, despite the possibility of him returning to the Jets slim. Marko Dano, like Ehlers, did not have the benefit on playing a superpower team. Dano did play well though for his team. Over his short NHL tenure thus far, Dano has been able to do three things: drive shot differentials, shoot a lot per minute, and score a lot per minute. At the worlds, though, Dano only really did the first thing on the list. 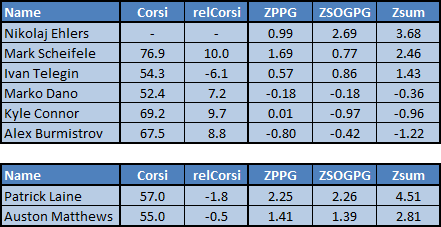 Dano was second in team Corsi percentage and relative Corsi for the Slovaks. 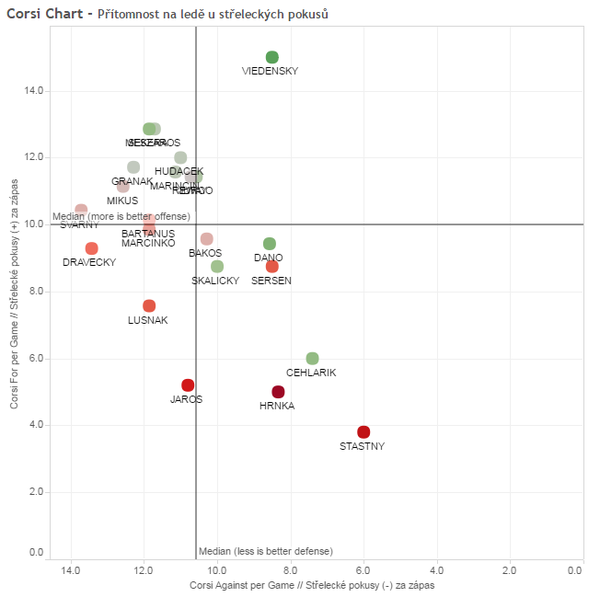 He did put up two points and put over a shot per game, but the Slovaks were likely looking for more from everyone (except probably Tomas Jurco). Kyle Connor lost time in the tournament due to an injury, but he served his team well in the games he played. While Connor did not generate a ton of scoring or shot volume, Team USA still out shot their opposition significantly with Connor on the ice, and by a greater amount than they did with him on the bench. Connor started the tournament on the wing of his former Michigan linemates Compher and Motte. 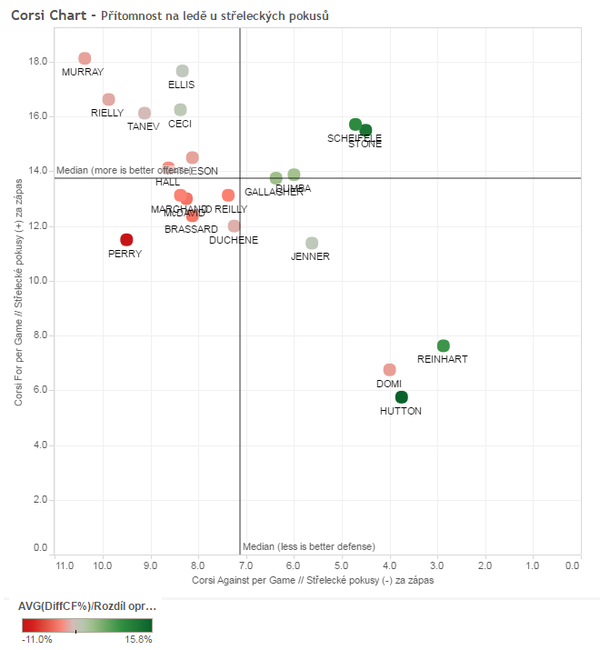 The contrast of their placement in the above chart suggests that Connor was the best player on the line. Part of his extreme defensive shot suppression though could come from sheltering usage rather than play, but it’s still a positive sign. It would be interesting to see how Connor would have performed given a full-health. There were a lot of fans hoping for Alex Burmistrov to be a positive addition to the Winnipeg Jets’ top-nine forwards for 2015-16. While Burmistrov has never been an exceptional scorer, his NHL Equivalent point per game production relatively improved while in the KHL and he was already a proven shot differential driver in the NHL. He struggled by an exceptional amount throughout the season to even do what he used to do, let alone improve… until the back-third of the season. As a positive sign, Burmistrov’s performance was once again much like the Burmistrov of old. He did not score much, nor did his team generate a lot. His team, though, did exceptionally well with him on ice, predominately through defensive impact. Burmistrov posted the third highest Corsi and relative Corsi percentage on Team Russia. The 24-year-old Russian will still have to prove to his team that he’s deserving a top-nine role, but Burmistrov could be an interesting player on the third line and would fit well with players like Mathieu Perreault and Marko Dano. While Patrik Laine did not drive shot differentials for his team, he did not perform poorly either. Laine though was one of the most exceptional talents in offensive generation, posting the second highest Offensive Z-Score and earning himself MVP nod for the tournament. The big 6’4 Finn showed elite finishing talent, leading the tournament with seven goals while generating 3.6 shots per game. Not to be outdone, Auston Matthews put up a strong performance as a young budding star in an elite men’s tournament. Matthews took a prominent role at a young age on a star team. While Matthews did not generate the same volume of shots or score as much as Patrik Laine, he was still one of the most successful go to players on the roster. He did do slightly better than Laine in relative Corsi, adding some credence and evidence to Matthews being the superior two-way player (although a lot of that has to do with projection rather than the now). If the Toronto Maple Leafs decide to go for Laine over Matthews, the Jets’ fans will survive with a potential franchise two-way centre as a consolation prize. Now THAT’s an NHL line ! A third line of Perreault / Burmistrov / Dano would likely be solid based on how well both Perreault & Dano meshed with Burmistrov during the last third of the season. Even given Burmistrov’s offensive challenges, Perreault would fill the role of playmaker and Dano is very comfortable being the guy directing a lot of shots on goal. That leaves Burmi doing what Burmi does best (at least when he’s playing with talented wingers since he struggles to do anything well IMO when he plays with grinders), and that’s play defense and keep the puck in the opponent’s zone far more often than his own end of the rink when he’s on the ice. Burmi was at best a spare part on the Russian team. He hardly played and when he did 5-6mins. per game. This guy has 0 upside…absolutely no offensive ability…NONE ! If Burmi centres the 3rd line, that would mean this team has no depth. Where’s the enigmatic Russian fit in ? There’s three centres battling it out for two bottom six spots. When Lowry centres skilled wingers, their production drops off. Therefore, I see the #3 centre battle (assuming Perreault is kept at LW) as being between Copp & Burmistrov. Burmistrov has already shown good chemistry with both Dano and Perreault AND the Jets can’t demote him to the Moose as he’d be claimed off waivers. Copp can still be sent down to the Moose without being subject to a waiver claim. In my opinion, this means that even if it’s somewhat close, Copp will be sent to the Moose. Lowry IMO will likely centre a 4th line that’s a checking / energy line. I believe that Burmistrov, who’ll be an RFA after this next season, will be given every opportunity to either show he’s a valuable part of this team going forward or, if coaches and management don’t see a fit going forward, allow him to impress enough by playing him with skilled line mates against soft competition so that he becomes a far more valuable trade piece than he is right now. The 2016/2017 Jets are going to be an exciting young team, but they won’t be Stanley Cup contenders. Therefore, it’s only logical that part of their plan for the upcoming season is to try to salvage Burmistrov whether as a part of the team going forward or as an impressive enough asset that some team offers a decent return for him via trade. Burmistrov does not score that well… but… Burmistrov scores far better than Wright. 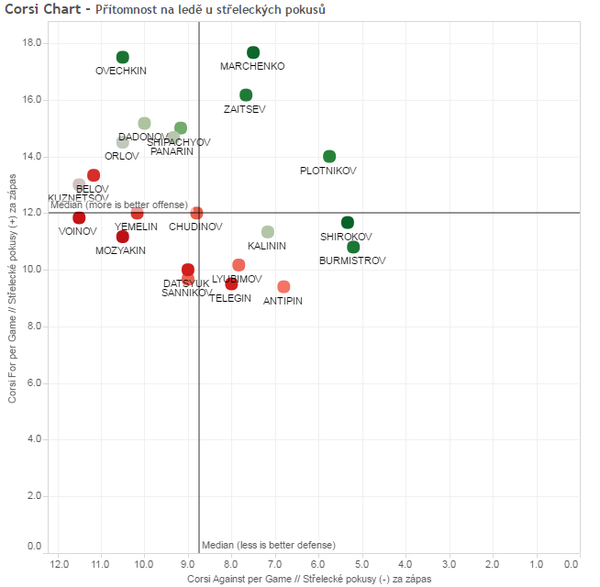 Burmistrov also scores far better than many players you have making the team. Put Copp there instead of Burmi and you’d have a somewhat dominating line…Copp’s much more talented..Burmi can’t even centre the 4th because that’s where Lowry will be. Burmi and Tanev are the same age and the same size. Why us Tanev notable as vying for a position over a player with real NHL experience? The hope at this point is that Tanev can develop into a capable depth player and PK specialist. Burmi already does that. Burmistrov scores Better than Perrault !? Stafford!? There are no NHL quantifying #’s for Lemieux, Tanev, Connor…and very little for Dano, Petan, and Copp’s played with dreadful forwards…so how can you make that assumption ?